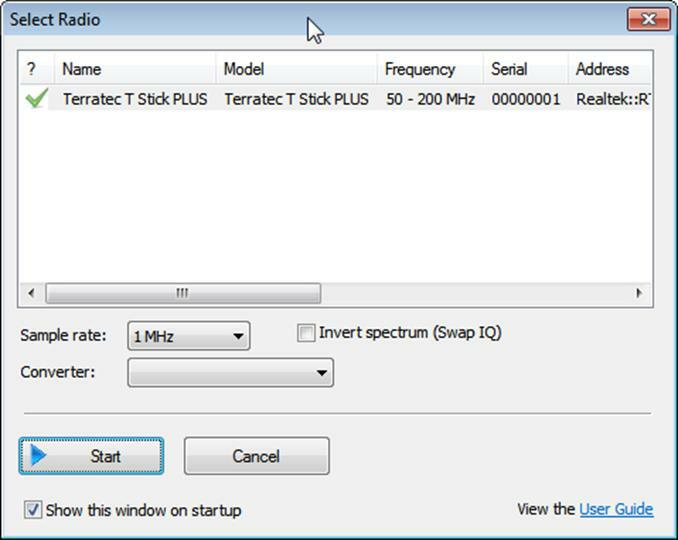 This page is a guide aimed at helping anyone set up a cheap radio scanner based on the RTL-SDR software defined radio as fast as possible on a Windows system. If you have any trouble during the installation, please see the troubleshooting guide further down the page. We also have brief instructions for getting started on Linux and OSX at the end of this page. Please note that the RTL-SDR is not a plug and play device. You will need to have sufficient skills to perform basic PC operations such as unzipping files, installing software, moving and copying files and have the motivation to learn new software. Quickstart Guide: rtl-sdr.com/QSG - Current page. Helps you install the software and set up your dongle. 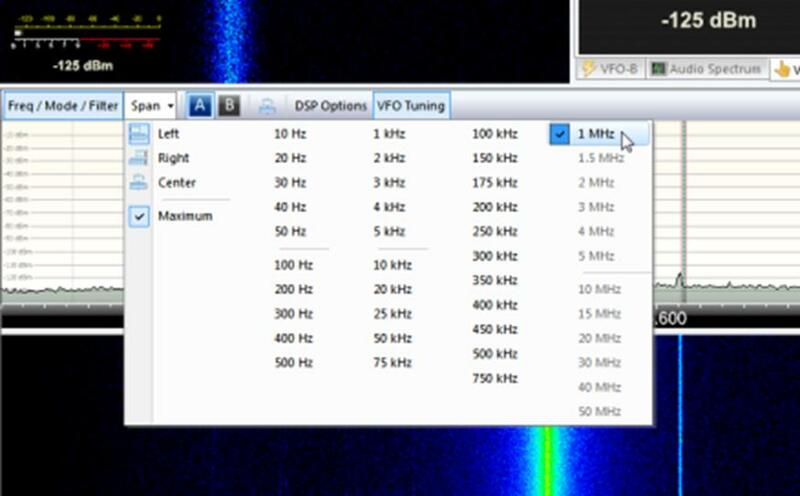 V3 Features Guide: rtl-sdr.com/V3 - Learn how to use special V3 features like the direct sampling HF mode and bias tee. SDR# Users Guide: rtl-sdr.com/SDRSHARP - Learn about the setting in SDR#. RTL-SDR BLOG V3 BUYERS: BE WARY OF COUNTERFEITERS. Opportunistic sellers are advertising all sorts of dongles under our brand "RTL-SDR Blog". The dongles with blue or green cases or sharp rectangular silver cases with a yellow PCB are not ours. Those dongles use poorer quality components, are designed cheaply, and may not have all the V3 features. We cannot provide support for counterfeits. The best place to purchase RTL-SDR V3 dongles is directly from our store at www.rtl-sdr.com/store. Currently, the most common RTL-SDR dongle is the R820T/R820T2 which usually sells for around $20 USD. See the Buy RTL-SDR dongles page for more information on purchasing. Generally at least a dual core processor will be required to run most SDR software smoothly. Some command line software and ADS-B decoders may work on less powerful hardware. To get the most enjoyment out of RTL-SDR you will need a decent antenna. Our packages that come with the dipole antenna set are a great start. Be sure to get them up high and outside (during good weather only) for best results. Units not sold by us may come with a smaller fixed length whip antenna that is okay for testing, but overall is not that great. The most recommended outdoor antenna for general scanning is a scantenna or discone due to their wide band receiving properties. You can also cheaply build a wideband planar disk antenna (pdf warning) out of some metal pizza pans. SDR# is the most commonly used SDR program on Windows. We recommend it as one of the easiest to setup and use with the RTL-SDR. Purchase an RTL-SDR dongle. The cheapest and best for most applications is the R820T/R820T2 dongle. Information on purchasing one can be found here. You must have the Microsoft .NET 4.6 or newer redistributable installed to use SDRSharp. Follow the link and install the redistributable. Most Windows 10 PCs should already have this installed by default, but PCs with older operating systems may need this to be installed in order to run SDR#. Note that .NET 4.6 is not compatible with Windows XP. If you are running XP please scroll down on this page and look for the HDSDR or SDR-Console install guides. Note that on some computers you may also need to install the Visual C++ Runtime if it is not already installed. Go to www.airspy.com and find the downloads button on the top menu. Next to the "SDR Software Package" heading click on the download button to download sdrsharp-x86.zip. Extract (unzip) sdrsharp-x86.zip to a folder on your PC. (Important! Many people who have issues forget this step! Do not run the files from within the zip file or the following steps will fail). (Also, do not extract into a folder within the Program Files directory, or installation may fail as these folders are often automatically made read only by Windows). Double click on install-rtlsdr.bat from within the extracted folder. This will start a command prompt that will download all the drivers required to make SDRSharp work with RTL-SDR. The command prompt will automatically close after a few seconds when it is done. It the bat file ran successfully the files rtlsdr.dll and zadig.exe will be downloaded into the SDR# directory. If they were not downloaded then your PC or anti virus solution may be misconfigured and may have trouble running batch files (Check that the folder is not read only, and not located in the Program Files directory). If install-rtlsdr.bat fails to download the dll or zadig, do a manual driver installation. Plug in your dongle. Do not install any of the software that it came with (if any), and ensure that you wait a few seconds for plug and play to finish attempting to install the dongle (it will either fail or install Windows DVB-T TV drivers). If you've already installed the DVB-T drivers that came on the CD bundled with some dongles, uninstall them first. In the folder where you extracted the sdrsharp files find the file called zadig.exe. Right click this file and select "Run as administrator". In Zadig, go to "Options->List All Devices" and make sure this option is checked. If you are using Windows 10, in some cases you may need to also uncheck "Ignore Hubs or Composite Parents". Select "Bulk-In, Interface (Interface 0)" from the drop down list. Note on some PCs you may see something like RTL2832UHIDIR or RTL2832U instead of the bulk in interface. This is also a valid selection. Do not select "USB Receiver (Interface 0) or Interface 1" or anything else or you will overwrite that driver! Double check that USB ID shows "0BDA 2838 00" as this indicates that the dongle is selected. We need to install the WinUSB driver, so also ensure that WinUSB is selected in the box after the arrow next to where it says Driver (this is the default selection). - Note that there has been some confusion for a few people over this step. The goal is to install the WinUSB driver. So to be clear, the box to the left of the arrow shows the currently installed driver, whereas the box to the right of the arrow shows the driver that will be installed in the next step. The first time you open zadig the box on the left will show either 'None', or the default DVB-T drivers installed by Windows (RTL2832UUSB), depending on your Windows configuration and version. Click Replace Driver. On some PC's you might get a warning that the publisher cannot be verified, but just accept it by clicking on "Install this driver software anyway". This will install the drivers necessary to run the dongle as a software defined radio. Note that you may need to run zadig.exe again if you move the dongle to another USB port, or want to use two or more dongles together. Open SDRSharp.exe and set the "Source" drop down box to 'RTL-SDR (USB)'. This "Source" tab is on the top left. (Note that the first time you do this you may get a smart screen message indicating that Windows has protected your PC, this is a false alarm. Simply click on "more info" and then "run anyway"). Press the Play button (the right facing triangle). Your RTL-SDR software radio should now be set up and ready to use! If everything has worked you should be able to start tuning to frequencies. Important! Don't forget to also adjust the RF gain settings by pressing the Configure button (looks like a cog) up the top next to the Play button. By default the RF gain is set at zero. A gain of zero will probably receive nothing but very strong broadcast FM - increase the gain until you start seeing other signals. To receive HF signals with a RTL-SDR.com V3, please see our V3 users guide. 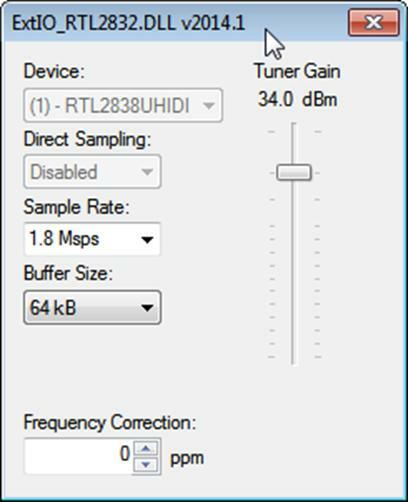 If you are using a RTL-SDR.com V3 dongle, view our V3 users guide to learn how to use the special features like HF direct sampling and the bias tee. Read out SDR# Users Guide to learn what each setting in SDR# does. Check out all our featured articles on this blog for various RTL-SDR related projects and tutorials. Upgrade from the stock antenna. For optimal reception you should use an outdoor roof mounted antenna. The optimal antenna will depend on the frequency and project you are interested in, but for a general all purpose antenna we recommend a Discone or planar disk antenna (pdf). If you are using your RTL-SDR for HF with direct sampling mode or an upconverter then we recommended using SDR# with the special decimation drivers. 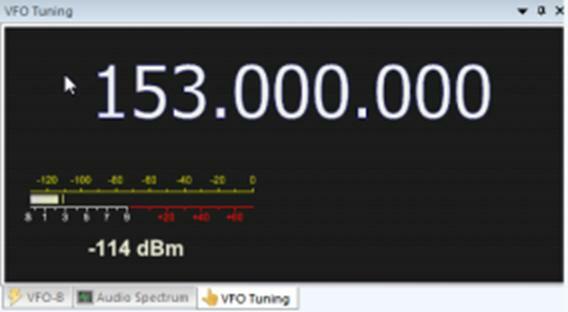 This will allow you to zoom in on the small bandwidth signals used on HF without loosing resolution. Check out our store for various RF accessories such as filters, LNA's and antennas. I get the error "No Device Selected" when trying to start the dongle in SDR#. Make sure you have run the install-rtlsdr.bat file, and that it has sucessfully downloaded the rtlsdr.dll file into the SDR# folder. If it is not downloaded, check that your folder is not set to "read only" (this sometimes happens automatically if you install into Program Files, so do not install into that folder). Another source of problems is if you have accidentally installed the WinUSB drivers to Bulk Interface 1 instead of 0 with Zadig. If you have done this, then SDR# will not recognise your dongle. TO fix it go into device manager or Devices and Printers and uninstall the driver for Bulk Interface 1. Long low quality USB extension cables can sometimes cause this error. Some USB 3.0 ports are also incompatible with the dongle and cause this error. One user has had luck with this error by installing zadig from safe mode. Finally, there is a small chance that the dongle is actually faulty. If the dongle produces the same error on multiple computers the dongle is probably faulty and should be refunded or replaced. One user has reported that this can happen when a Windows Update has failed, and is continuously running in the background without your knowledge. Another solution that people usually have success with is using an alternative zadig tool available at visualgdb.com/UsbDriverTool. Use the tool to install the WinUSB driver. Zadig shows NONE in the driver install screen. Some users have reported this as an issue, but this is normal. The box on the left indicates the CURRENTLY installed driver. The box on the right indicates the driver THAT WILL BE installed after clicking on the install button. When trying to run Zadig I get an error "This app can't run on your PC", or "The version of this file is not compatible with the version of Windows you're running". I have a 64-bit PC. This is due to some sort of problem with your PC's configuration, although exactly what is unknown. Users have found that downloading the file manually with Chrome also produces the error, but downloading it with Edge browser results in a file that works. So try downloading from the Zadig website in Edge, or using the alternative tool at visualgdb.com/UsbDriverTool. My dongle was working before but today it no longer works and displays an error when I click on Play. 99% of the time this is because Windows automatic driver updates has automatically removed the SDR drivers and installed DVB-T drivers in its place. Make sure Windows automatic driver updates are turned off, and rerun zadig to reinstall the WinUSB driver. Windows 10 updates broke my dongle! Windows 10 updates sometimes overwrite the SDR drivers with broken Windows ones. Simply run zadig again and install the drivers again to fix it. My dongle gets extremely hot and stops working, or doesn't work at all. USB current measures well above 0.3A. It is normal for the dongle to be hot or warm during operation. But there is a small number of RTL8232U chips that come from the factory faulty (we measure this at less than 0.3%). They draw very high current, cause excessive heat and eventually fail. Some units will work for a few minutes to hours before exhibiting issues, and others will fail instantly. If you have a USB current meter you can check and see if the current draw is above 0.3A. If higher then something is wrong with the RTL2832U. If you suspect a fault like this contact the manufacturer of your dongle and ask for a refund or replacement. I get the error "1 compatible devices have been found but are all busy" or "libusb Open error -12"
First check that another program is not using the RTL-SDR. To fix this it may be necessary to reinstall the drivers via zadig and to try every USB port on the PC. You may want to also try disconnecting all other USB devices connected to the PC. Also some USB 3.0 ports are buggy, switch to a USB 2.0 port. Some users have also had success with installing everything from Windows safe mode. Make sure you are not selecting the "USB Receiver (Interface 0)" in zadig, and instead are selecting the Bulk in interface, or one that may say RTL2838UHIDIR or something else prefixed with RTL. If you don't see this make sure that "Options->List All Devices" is checked and that "Ignore Hubs or Composite Parents" is unchecked.Another thing to try may be to disable Windows automatic driver installation. Instructions for disabling this can be found here. This error also sometimes occurs after the computer has been suspended - to fix it simply disconnect and reconnect the dongle. In SDR# get the error "Unable to load DLL 'rtlsdr': the specified module could not be found. (Exception from HRESULT: 0x8007007E)"
Usually installing the Visual C++ Runtime solves this problem. Most PCs have this installed already, but if you are on a freshly installed version of Windows it may not have been installed yet. With SDR# I get the error "The application has failed to start because its side-by-side configuration is incorrect". If you are using the x64 version try the x86 version. This can also indicate a corrupted .NET install on your PC. Attempt a .NET repair or reinstall. There is a constant spike in the middle of the spectrum that won't go away. This is normal and is a side effect of the design of most RTL-SDR dongles. It can be removed algorithmically in the SDR# software by checking the "Correct IQ" box. If you are using an E4000 dongle select offset tuning instead. You have probably not run zadig in administrator mode. Make sure to right click zadig, and select "Run as Administrator". If that fails to work try the alternative WinUSB installer at visualgdb.com/UsbDriverTool. Ensure "Options->List All Devices" is checked. Sometimes you may also need to uncheck "Ignore Hubs or Composite Parents". Some people report seeing something else other than the bulk in interface. It may also show up as the brand of your dongle or something prefixed with "RTL", e.g. RTL2832U or RTL2832UHIDR. Any of those options should work too. In rare cases you may receive a faulty dongle that will not show up in Zadig no matter what USB port or computer you try it on. You should ask for a replacement in this case. You may have downloaded a version without rtl-sdr support. Check that you have downloaded the official version from the airspy.com website. Unfortunately some cheap USB 3.0 controllers are buggy and don't work with some USB 2.0 devices. Generally, USB 3.0 works fine with the RTL-SDR, but there are some controllers that will just not recognize the dongle. In this case use a USB 2.0 port instead. This is probably because you did not unzip the files and you are trying to run install-rtlsdr.bat from within the zip file. Remember to extract the files first, before running them. When I run install-rtlsdr.bat a CMD/DOS window flashes on the screen briefly then disappears. Nothing is installed. There seems to be a bug or misconfiguration with some versions of Windows where batch files cannot be run. One way around this is to install the RTL-SDR drivers manually. We have instructions for this here: rtl-sdr.com/manual-installation-of-sdr. Some antivirus solutions are also overly restrictive and do not allow .bat files to be run. In this case either disable or install a better antivirus, or perform a manual driver install. Make sure you have increased the RF gain slider which can be accessed by clicking on the configure button. Also, in poor reception areas using the stock antenna indoors may not be sufficient. First test with the antenna placed up high outside. In some cases with the stock antenna the connection to the antenna can become disconnected in the antenna base causing unexpectedly poor reception. In rare cases if you still cannot receive any strong signals and another radio can, then you may have received a broken dongle and should ask for a replacement. SDR# gives error "Application failed to initialize properly (0xc0000135). Click OK to terminate." This might mean that you do not have the correct .NET Framework installed. SDR# gives error "Object reference not set to an instance of an object"
This may mean that you do not have an audio driver properly installed on your PC, or that you do not have any output audio devices enabled. Enable them in the windows Sound Playback properties. First test to make sure that it is not the fault of a dodgy USB extension cable by plugging the dongle directly into the PC. If it still disconnects often the dongle may be faulty and you should ask for a replacement. This appears to be a bug with SDR# or Windows. The solution right now is to simply turn display sleep off. The dongle is faulty and should be refunded or replaced. For graphical GUI SDR software like SDR#, at least a dual core processor is recommended. If you have a borderline decent CPU and still experience high CPU usage, try reducing the sample rate to 1 MSPS or less, reducing the FFT display resolution (or turning it off), turning off Correct IQ and reducing the filter order. This is because you would have clicked the install button in Zadig after selecting the wrong device in the drop down menu. Please don't randomly click things in Zadig. Make sure you select the correct RTL-SDR device, (Bulk-In Interface, Interface 0) first. Zadig overwrites previous drivers. To get the old drivers back you should be able to do so in Windows device manager, update driver software. The R820T2 and R820T are identical electronically except for some minor changes in the maximum IF filter widths that occurred by accident from using higher quality silicon in the R820T2. The accidentally different filters and higher quality silicon may be the reason the R820T2 has generally better performance and less manufacturing variability. Thus a R820T2 will show up as an R820T on the PC, since there is no distinction between them in the digital part of the circuit. You can confirm that you have a R820T2 by checking the markings on the chip. My antivirus shows SDR# as a virus. This is almost 100% a false positive. SDR# is updated often and thus a new .zip file is sometimes released almost daily. Poorly designed antivirus programs will sometimes assume that any file that is not downloaded often is a virus. With SDR# being updated so often it takes a while for many people to download the new version and build up trust with the antivirus company. The Mode selection buttons in SDR# are graphically glitching and I cannot click on them. Some users have found that this bug is caused due to selection of a "custom scaling level" or "custom sizing options" in Windows. Reset this option back to default in Windows display settings to fix the bug. When closing SDR# I get an error like "An error occurred loading a configuration file: Access to the path 'C:\Program Files\SDR\s14i12qq.tmp' is denied. (C:\Program Files\SDR\SDRSharp.exe.Config) ---> System.UnauthorizedAccessException: Access to the path 'C:\Program Files\SDR\s14i12qq.tmp' is denied." This is usually because you have copied the SDR# files into a folder that is read only. In Windows folders located in "C:\Program Files" are usually automatically read only. To fix, install SDR# into a non read only folder that is not located in Program Files, for example "C:\SDR". My dongle came with a remote control. What is it for? Some sellers opt to include the remote control that is used for changing TV channels. It is only useful for when the dongle is used for its original purpose - as a DVB-T HDTV receiver. The remote control has no purpose when the dongle is used as an SDR. I want to watch DVB-T with my dongle, how do I do it? The original purpose of the dongle was for DVB-T TV, and it can still do this. But please note that the DVB-T drivers and the SDR drivers are different, and they cannot both be installed at the same time. You can download the DVB-T drivers here. We recommend using Prog-DVB as the TV software. You must turn on the direct sampling mode for HF reception. Please see the V3 users guide for information on how to activate the direct sampling mode. I get the error "rtlsdr_demod_write_reg failed with -9" on command line based software like rtl_fm, rtl_test, the bias tee software etc. This usually means that there is some issue with the USB port on your PC not working correctly. Try other USB ports on your PC, and confirm that the dongle operates on another PC. If you continue to have issues please feel free to post in the troubleshooting section of our Forums. The gain can be adjusted in SDR# by clicking on the Configure button which looks like a cog. When tuning the RF gain you are trying to get the signal as strong as possible, whilst keeping the noise floor as low as possible. Start with a low gain setting, and slowly increase the gain slider. Watch in the frequency spectrum as the signal strength increases, but stop just before the point at which the noise floor starts to rise. The noise floor is the part of the frequency spectrum where there are no signals. The official list of SDRSharp plugins can be found here and our unofficial list of plugins can be found here. 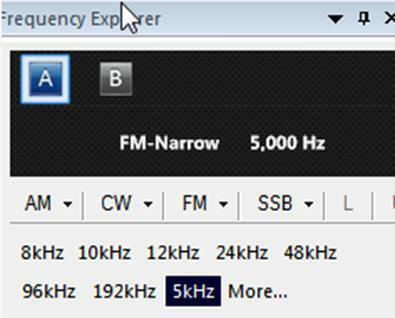 A good guide to learning how to use SDRSharp and what all the options do can be found here. Another great illustrated guide can be found here. Plug in your dongle and do not install any of the software that it came with, but ensure you let plug and play finish trying to install it. If you've already installed the software drivers it came with previously, uninstall them first. Go to http://zadig.akeo.ie/ and download Zadig. In Zadig, go to Options->List All Devices and make sure this option is checked. Select "Bulk-In, Interface (Interface 0)" from the drop down list. Ensure that WinUSB is selected in the box next to where it says Driver. (Note on some PCs you may see something like RTL2832UHIDIR or RTL2832U instead of the bulk in interface. This is also a valid selection). (Do not select "USB Receiver (Interface 0)" however). Click Install Driver. 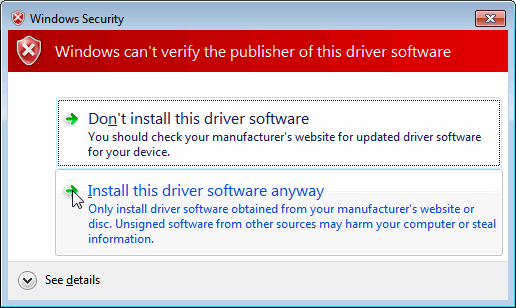 You might get a warning that the publisher cannot be verified, but just accept it by clicking on Install this driver software anyway. This will install the drivers necessary to run the dongle as a software defined radio. Note that you may need to run zadig.exe again if you move the dongle to another USB port, or want to use two or more dongles together. Download HDSDR from http://hdsdr.de/, using the download button at the bottom of the page. Use the installer you just downloaded to install HDSDR. Go to http://hdsdr.de/hardware.html and download the ExtIO_RTL2832U.dll dll file from the table entry "RTLSDR (DVB-T/DAB with RTL2832) USB" (Direct Link). 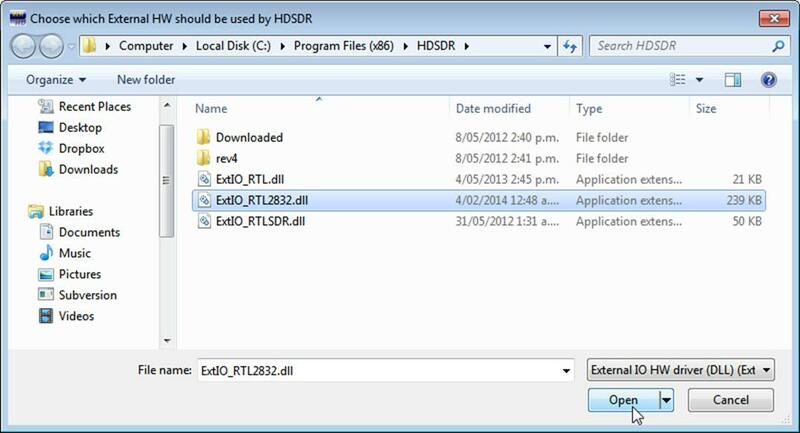 Copy the ExtIO_RTL2832U.dll file into the HDSDR install folder which is by default set to C:\Program Files (x86)\HDSDR. Open HDSDR. You might be asked to select a .dll file. Choose the ExtIO_RTL2832U.dll file you just copied over and then click Open. It is okay if you do not see this screen as long as you have copied the ExtIO_RTL2832U.dll file over properly in the last step. 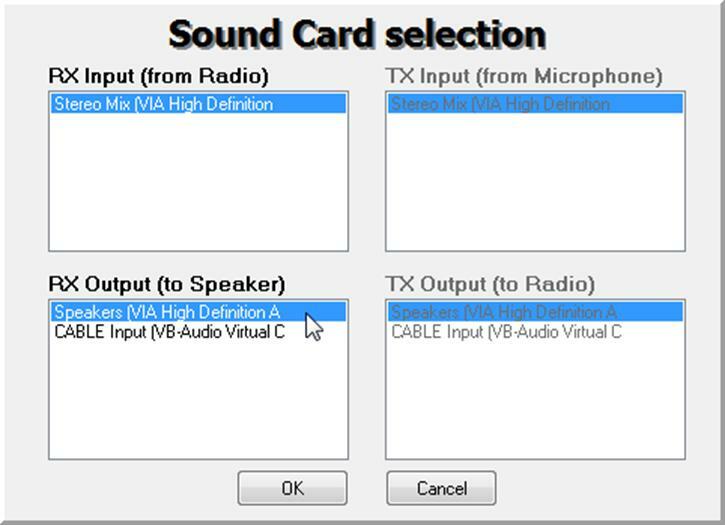 Choose your output sound card by clicking on the Soundcard button in the bottom left corner, or alternatively by pressing F5. The only important setting here is the “RX Output (to Speaker)” setting which you should set to your speakers, or desired audio piping software. Click on the Bandwidth button or alternatively press F6. Choose an output Sampling Rate of 48000 Hz for general NFM signals, or choose 192000 for wideband FM signals, like broadcast FM. Press Start or alternatively press F2. This will start the SDR. 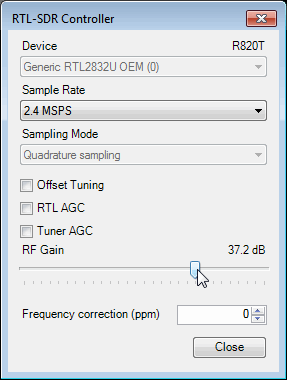 To set the RTL-SDR sample rate, gain and frequency correction click on the ExtIO button . To tune to a station, change the Local Oscillator frequency to a frequency near the frequency you are interested in. Then tune to the desired frequency either by clicking in the RF spectrum, or using the Tune numbers. You can zoom in and out of the spectrum by using the Zoom slider which is to the left of the word zoom. The mode can be altered by clicking on the mode buttons. 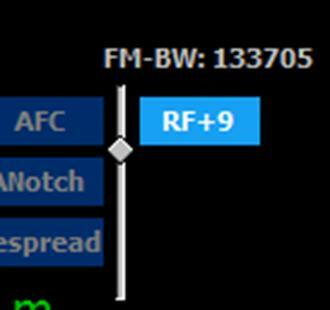 After clicking on the FM mode button, the FM bandwidth can be manually modified with the FM-BW slider. To listen to a typical wideband broadcast FM station, you will need to change the audio sampling rate to 192000 Hz. Do this by clicking on the Bandwidth button or alternatively by pressing F6 and then selecting the output sampling rate as 192000 Hz. Download the SDR-RADIO installer from http://v2.sdr-radio.com/Software/Download1. Use the installer to install SDR-RADIO. Download the RTL-SDR support package from the link at http://m3ghe.blogspot.com.au/p/adding-support-for-rtl-sdr-usb-dongles.html (MIRROR). Extract the SDRSourceRTL2832U.dll, rtlsdr.dll and libusb-1.0.dll files from the x64 folder into the C:\Program Files\SDR-RADIO-PRO.com folder. Or if you have a 32-bit PC extract the files from the x32 folder into C:\Program Files (x86)\SDR-RADIO-PRO.com folder. Open SDR-RADIO. Upon opening it you will be greeted with the Select Radio screen and a prompt saying “List is empty – add radio definition now?” Click Yes. If this prompt does not display, click the + Definitions button. 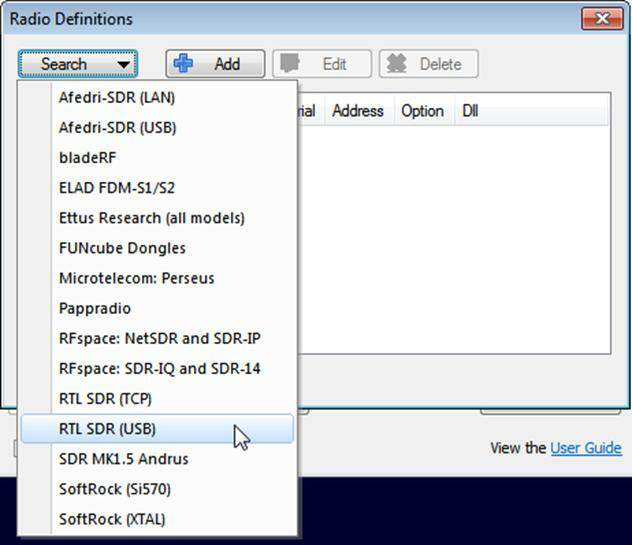 In the new window open the Search drop down menu and select RTL SDR (USB). After clicking it the RTL-SDR will be added to the Radio Definitions list. Click OK.
Click on the RTL-SDR click to select it, choose your desired sample rate then click Start. Click on the Span button and adjust the span to the sample rate bandwidth you chose in the last step. This will let you see the whole spectrum. To change the receive mode use the left menu under the frequency tab. You can also change the signal bandwidth here. NFM signals are typically around 12 kHz wide and broadcast FM is typically around 192 kHz wide. To adjust the frequency, use the VFO tuning box on the right side. If you don't see it you may need to click on the VFO tuning tab. Also if the screen is too small you may need to expand it's size to show it. You can also click on the waterfall to instantly tune to the clicked frequency. Be sure to adjust the gain settings using the RF gain button in the top which is under the Home tab. By default it is set to automatic. Also to adjust the waterfall colors so that signals are more clearly seen go to the Display tab up the top and then click on the Automatic Calibration button on the very top right. Warning: CubicSDR is software that is in alpha stages of development. That said, at the moment it is fairly stable and quite easy to set up. Go to cubicsdr.com and go to the downloads page. Find the download link for the latest version. Download the version suitable for your particular version of Windows. Plug in your dongle and run CubicSDR from your start menu. You will be greeted with a SDR Devices menu. 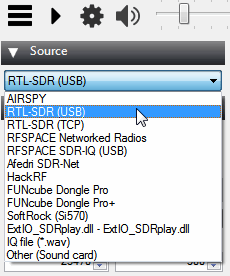 Choose your RTL-SDR from the menu and click on the "Use Selected" button. Click anywhere on the waterfall to start listening. 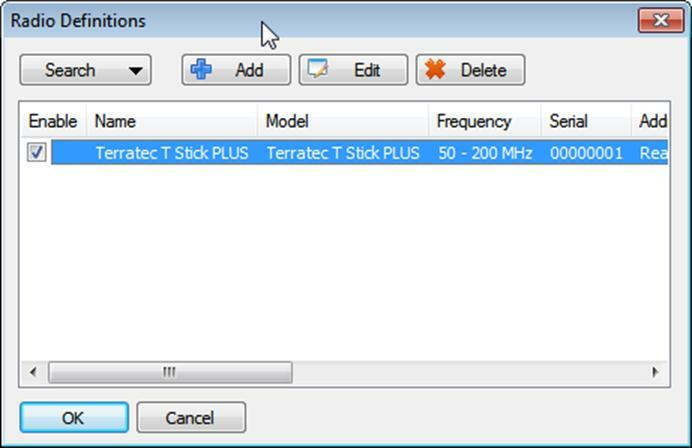 See the Software Guide for a big list of other compatible RTL-SDR software. For Linux we first recommend having a look at Ranous' Linux Quickstart guide document which can be found here (pdf). The easiest way on most Debian Linux systems is to install rtl-sdr via apt-get. This can be done with the following commands. We recommend using the most modern version of Linux OS that you can find for your system to get the latest drivers. After installing the libraries you will likely need to unload the DVB-T drivers, which Linux uses by default. To unload them temporarily type "sudo rmmod dvb_usb_rtl28xxu" into terminal. This solution is only temporary as when you replug the dongle or restart the PC, the DVB-T drivers will be reloaded. For a permanent solution, create a text file "rtlsdr.conf" in /etc/modprobe.d and add the line "blacklist dvb_usb_rtl28xxu". You can use the one line command shown below to automatically write and create this file. Now you can restart your device. After it boots up again run "rtl_test" at the terminal with the RTL-SDR plugged in. It should start running. NOTE: Some devices like the Orange Pi zero have a bug in their current mainline OSes. Instead of blacklisting "dvb_usb_rtl28xxu", you will need to blacklist "dvb_usb_rtl2832u". If you installed rtl-sdr by "apt-get", you will need to update the black list file at /etc/modprobe.d/rtl-sdr-blacklist.conf manually too. After installing the libraries and black listing the DVB-T drivers we recommend starting off with GQRX, a SDR program similar in operation to SDR#. It can be downloaded via the package manager in your Linux distribution or from http://gqrx.dk/download. We can now also recommend the multi-platform CubicSDR which can be downloaded from http://www.cubicsdr.com/. If you want to install GNU Radio we recommend using Marcus Leech's script by typing the following into terminal. This installs the RTL-SDR drivers as well. Note that if you want to run Linux in a virtual machine it has been reported that RTL-SDR performance with VirtualBox is rather poor due to it's slow USB connection. VMWare Player on the other hand has good performance - just remember to set the USB controller to use the USB 2.0 protocol as by default it is set to USB 1.1. Another good Linux quick start guide written by Kenn Ranous can be found here (pdf). As there is a severe lack of SDR software for OSX, we recommend using either Linux or Windows. However, GQRX is a SDR program that works well on OSX. Instructions for its installation on a Mac can be found on this video https://www.youtube.com/watch?v=TS588qDxdBA. We can now also recommend the multi-platform CubicSDR which can be downloaded from http://www.cubicsdr.com/. For a comprehensive book about the RTL-SDR you may be interested in our book available on Amazon. Available in physical and eBook formats.